1. Click on the video thumbnail to watch the video. 1. Here you can see the video title. 2. Here you can see extra detail about the video such as how long it is, the date it was recorded, and video details. 3. Here you can see the description for the video. 4. Click the button here to watch the video. 5. Click the button here to delete the video from your library. You can use the media controls on your remove to play, pause, fast forward, and rewind the video. 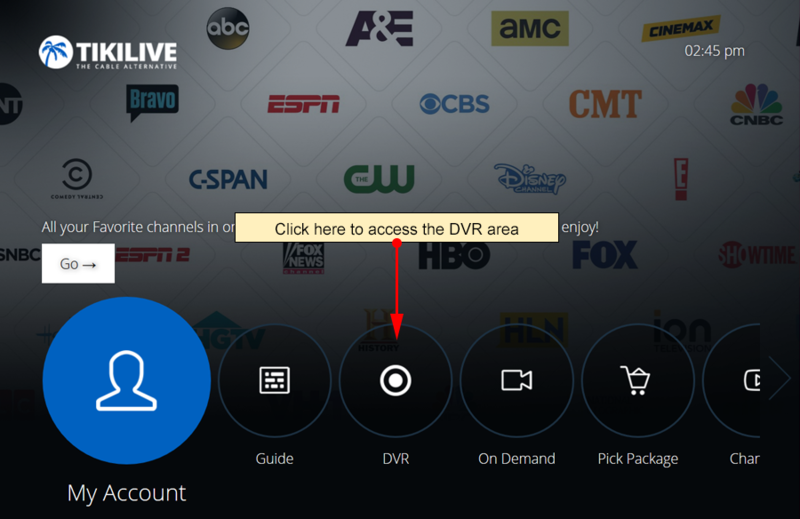 While watching a DVR you can fast forward or rewind it and navigate to the specific time of the DVR. Clicking on the right button you can fast-forward the video (if the remote control you are using has the FF button then you can use that also). If you click on OK (or Play) button the preview will stop and the video will start playing from that moment. You can also use the left button of the remote control (if the Rewind button is present you can use it as-well) in order to rewind the video and watch the previous screens.